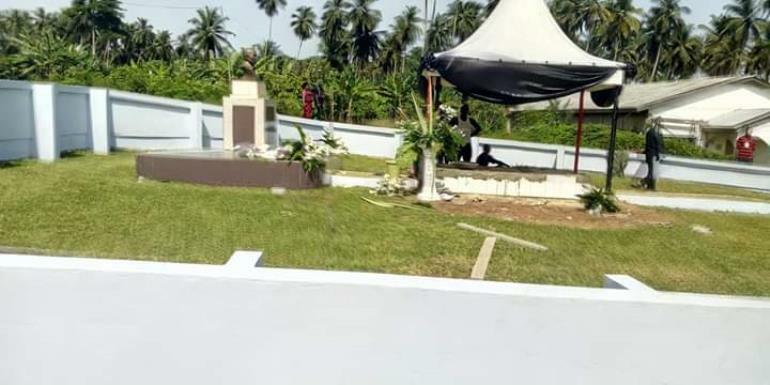 Former Member of Parliament for Jomoro Constituency and a former Education Minister under President Atta Mills era, Lee Tandoh Ocran has been finally laid to rest today, Saturday, April 13, 2019. His burial service was held at his hometown, Nawule near Half Assini in the Jomoro Municipality in the Western Region. During his burial service, former President John Mahama who is the current leader of the NDC expressed his worries over the departure of Lee Ocran and therefore said Lee Ocran was a very principled person. "...Lee Ocran was an unrepented Nkrumaist and know that I came from Nkrumaist family, I became a close comrade of his, we became friends at East Legon", he revealed. He concluded "And so, on behalf of the whole NDC party, we wish our Comrade Lee Ocran a peaceful rest, may his soul rest in perfect peace". Other party officials and some MPs including Johnson Asiedu Nketia, NDC General Secretary, Samuel Ofosu Ampofo, NDC National Chairman, Joshua Akamba, NDC National Organiser, Emmanuel Armah Kofi-Buah, Ellembelle MP, Jomoro MP, Paul Essien, North Tongu MP, Samuel O. Ablakwa, NDC Western Regional Chairman, Nana Toku, NPP Westerm Regional Chairman, Francis Ndede Siah, Nana Oye Lithur, former Gender Minister, former Chief of Defence Staff, General Blay, Catherine Afeku, NPP's Evalue-Ajomoro Gwira MP, Kwasi Pratt Jnr, Haruna Iddrisu, Minority Leader, Amenfi West NDC's MP, Eric Afful, Isaac Adjei Mensah, MP for Wassa East, Ato Ahowoi among others were there to commiserate and pay their final respects.